« Club Fitness K&N Grand Opening Celebration! New & Used Parts & Equipment! 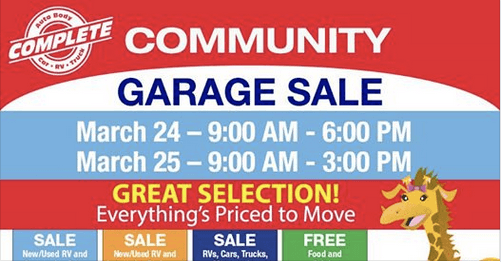 Used RV’s, Trucks & Cars will be for sale! Misc Items.. will be For Sale! Pictures will be posted of items and vehicles for Sale leading up to the event! Looking for something particular post a comment on the EVENTS PAGE! We may just have it !!!! CHECK IN AT COMPLETE ON FACEBOOK FOR SPECIAL DISCOUNTS! For more information on our Services and more about this GREAT FAMILY OWNED COMPANY!